The cover of the Gafla DVD says “India's first film on a stock market scam”, and I suppose that's true. 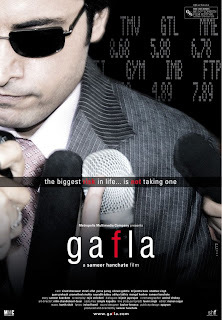 Originally released in 2006 (and included in the London Film Festival that year), Gafla is a loose adaptation of the events leading up to and encompassing the Harshad Mehta scam of the 90's. Here we have Subodh Mehta (Vinod Sharawat) getting into the stock market world first as a wide-eyed apprentice with a brokerage firm, then climbing up the professional ladder. He eventually becomes his own boss and engineers resources at hand to manipulate stock prices that lead to a rigged bull-run. The expose of his attempt to fund his venture by illegally harnessing the resources of banks eventually lead to the end of his success story. Gafla portrays the Harshad Mehta character in a curiously whitewashed manner, as an entrepreneur who does what he does with the intention of expanding the stock market and increasing the investor base, thereby bringing democracy to the market and prosperity to the small investors. He is shown as a maverick crusading against a coterie of suited tycoons that for reasons of their own periodically crash the market. The Mehta of the film says that his investments are always in firms he has thoroughly researched for their potential and that by following his lead “the market will never crash”, something of a large swallow. His downfall is shown entirely as the work of his rivals in collusion with corrupt journalists. To Gafla's credit it is a sincere and focused film that doesn't stuff in any needless commercial elements like songs, cheap sexuality or ornate romance sequences, and more importantly no significant detours from its plot line. Mehta is shown as someone willing to do anything to achieve his ends, including marrying for political advantage (without the usual associated melodrama for such moments). Vinod Sharawat in the lead role acquits himself in a decent manner. The problem however is that the treatment is linear and lacks any emotional strength. In a 2 hour film that charts a significant period of its protagonist's life, there are hardly any memorable moments; contrast this with Oliver Stone's Wall Street or David Fincher's The Social Network, which made sure to have a strong dramatic element in the progression of the story, and interesting characters. Neither do Hanchate and his team have the creative chops to make the film interesting on a technical level. I don't know how much research was done for the project, but the portrayal of the workings of the stock market seem empirical and simplistic, little above the “Market mein saare shares khareed lo (buy up all the stock in the market)” depiction of business rivalry in several archaic Bollywood films and TV serials. Combined with production values and flat visuals normally associated with the more recent Dev Anand films, it feels more like a movie composed of footage excerpted from an 80's era Indian television serial. 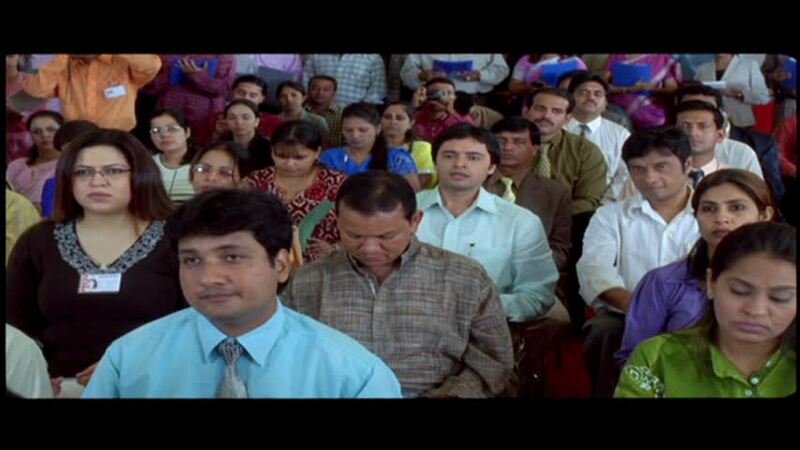 The presence of tele-serial actors of that period like Shakti Singh and Somesh Agarwal only adds to this feel. 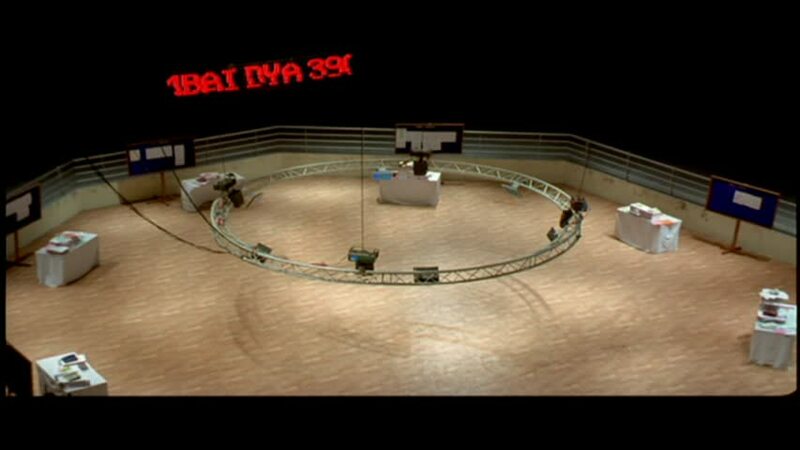 The DVD of the film by one Junglee Home Video, claims to have an anamorphic transfer (and even instructs you about adjusting your TV settings for the same). But it is an amazing botch up job in which they have somehow managed to generate an anamorphic signal for a stretched out 4:3 image. To illustrate, I have here modified one of the film's images to a 4:3 ratio and you can see that this looks less distorted than the original so-called anamorphic image (yep, Vikram Gokhale isn't THAT fat :D). The film also has an official website HERE.